Kirk Hopper Fine Art is pleased to exhibit New Works by Houston artist, Matt Manalo. This exhibit will feature Matt's most recent mixed media paintings in our Project Space. 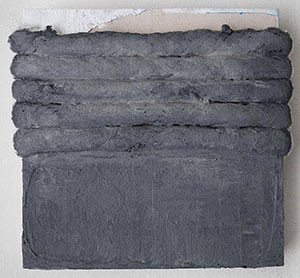 Concrete (Gray), mixed media on panel, 12" x 12"
Originally from Manila, Manalo creates work as a form of an ongoing journal of experiences from his time living in the Philippines in juxtaposition to his life in the United States. At the age of 18, Matt Manalo and his family decided to move to the United States in pursuit of a better life. Although living in a city as diverse as Houston, he continues to reconcile his old life with his new life in the largest city in Texas. Matt states, "as an artist, I was looking for a tangible outlet to express my feelings, memories and newfound experiences." He is constantly redefining his definition of "Home," while struggling with memories from his homeland and the feeling of being split into two pieces emotionally. Manalo's work represents an abstracted image of a specific place or memory from either back home or from his new surroundings in Houston. The artist incorporates repetitive marks, shapes, collage and/or stamped images and scratch marks on his work. They signify the amount of "to and fro" with flashbacks that he has when making a piece. One notable aspect of Manalo's work is the significant amount of physical or visual texture on the surface, which represents the grittiness of living in a city like Manila. As one will notice, Filipino artist Matt Manalo has two very different stories to tell. Matt Manalo was born and raised in Manila, Philippines. He moved to the United States along with his family to pursue his education. He received his Bachelor of Fine Arts in Painting with a minor in Art History at the University of Houston. He has always been drawn to making art since he was a child. He grew up being heavily influenced by comic books and cartoons. His intuitive art making process includes the processes of collage, painting, and sculpture. His work talks about his identity as a Filipino and the places in which he has lived. 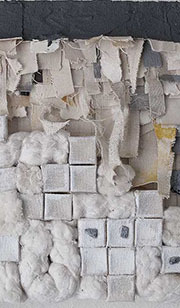 Assimilation 01 (detail), mixed media on panel, 12" x 12"